Who needs a red carpet… - Do You Speak Gossip?Do You Speak Gossip? When you can have a red wall? These pics were taken on T’s house, by T himself. Hehe… I think that the result is quite impressing….Starting to feel the difference between my old and new camera. Anyway, that afternoon was really cold and rainy, hence the first appearance of boots and tights. I wasn’t ready for them, but didn’t want to catch a cold either. I was already feeling terrible that afternoon, but T. promised to take me for a bit of shopping, and not even that terrible pain could stop me from it. So, took some painkillers, and off I went for shopping. I didn’t actually buy what I was going for, but bought some really nice stuff, I’m going to show you on another post. Remember the dress I showed you a few weeks back? It was too warm outside to wear it then, but the time for it has finally come. H&M dress, Penny Black bag, random boots (bought last year, but totally beaten up from the use, and the bad weather), Donna Karan sunglasses, vintage watch, and gold plated earrings from a local shop. A small bun was the perfect finish to the outfit. Don’t you think? Finishing this post with some details of the outfit! Waiting for your comments! And if you like this blog, it would mean a lot to me to follow it, in any way. Find your preferable widget, and follow! P.S. In 2 days I’m leaving for Nafplio with my bf for six days, so I’m going to schedule some posts for you to read while I’m away. So keep commenting, cause I love reading your comments. I’ll visit your blogs when I get back. Have fun and see you soon! τέλειο το φορεματάκι…μου αρέσει πολύ το χρώμα και το συνδύασες πολύ ωραία με τις μπότες! Και ο κότσος σου πάει πολύ!! Ο τοίχος (και η “αψίδα” αυτή) προσφέρονται για φωτογραφίες!! Καλά να περάσεις στο Ναύπλιο! έχω χρόνια να πάω αλλά είναι ωραία πόλη! S’euxaristw poli Anna! Exw idiaiteri adinamia stis mpotes mou to xeimwna! I really like you hair! Cute outfit! S’euxaristw poli! Na’sai kala!… Kalwsirthes sto blog mou! Elpizw na ta xanapoume sintoma! I love the outfit, darling! P.S. Thank you! I’m now following you back. Your dress looks so chic on You with those long boots and sunnies! We are having terrible weather too. all weekend . Thank you so much Ramona! Lovely dress And I like the hair! I follow U now, and if u like my blog I hope U follow me back! Thank you very much for the follow Miss Ewig! I’ll visit your blog asap! Πολύ ωραία εμφάνιση!! Μου άρεσε πολύ ο κότσος!! Καλή εβδομάδα!! Μοντέρνα Σταχτοπούτα recently posted..Τα νέα ρολόγια της LOISIR ! Δες την νέα συλλογή Deco Watch! S’euxaristw poli! Kali evdomada kai se sena Monterna Staxtopouta! definitely agree about the bun. love it! Thank you veronica! hahah Den nomizw na mou paei re gamwto..kai eida ena toso wraio forema sto Zara tis proalles! Min anisixeis omws, foraw arketo xrwma kai to xeimwna…apla oxi toso fwteina oso to kalokairi! Very anxious or curious to see what the courier did, I checked now and saw it’s there!!! Hopefully before the trip!!! Oh, 6 days, marvellous! I hope you feel better soon (guess who is sick too… me…I barely left bed today!) and that you have a lovely and romantic trip!!!! And please, you and T., you know, count on me whenever I can help! After wishing a great trip (that I’m sure it’ll be! ), now it comes to your looks that – as aaaaaaalways!!! and you know that! – is simply great! I loved the dress and the boots, wow!!!! They don’t look that worn! For me they look as if you have just bought them! They are really great and you definitely lost weight now, don’t tell me you didn’t… cause if you tell me so, I want the same dress, you look so thin! Aww I hope you feel better soon sweety! It’s so annoying to have soar throat. Thank you so much for all your help. We got the package today as I told you on you blog, a few minutes ago. I love the boots too, I was in love with them from the moment I saw them, but I wore them out I think. They have scratches everywhere, and the leather in some spots is ruined. And I got them last year. Not to long ago for a pair of boots. I had lost weight, but I gained a few grs. back these last two weeks. But I’m glad that I look thin to you, cause I was really bloated when these pictures where taken. Really. The dress is really large, althought it’s the smaller size. You can buy it too if you like it. It comes in camel and light pink too! 🙂 And you’re not stupid, these things happen. I’m sure you’ll get your boot back sometime. 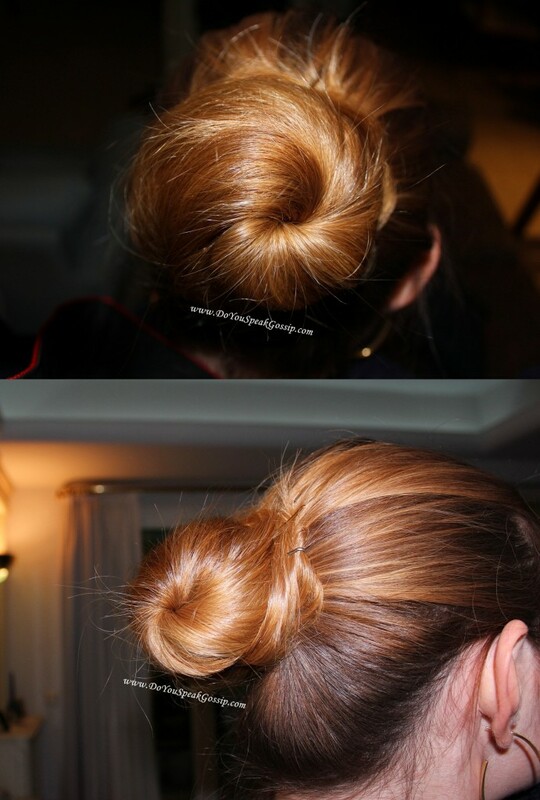 love the bun; and your hair have such a lovely shade! Love this look, darling!! Those boots are fab! And I’m loving the dress!!! Have a great week, doll! I love how your plum dress pops against the red wall. 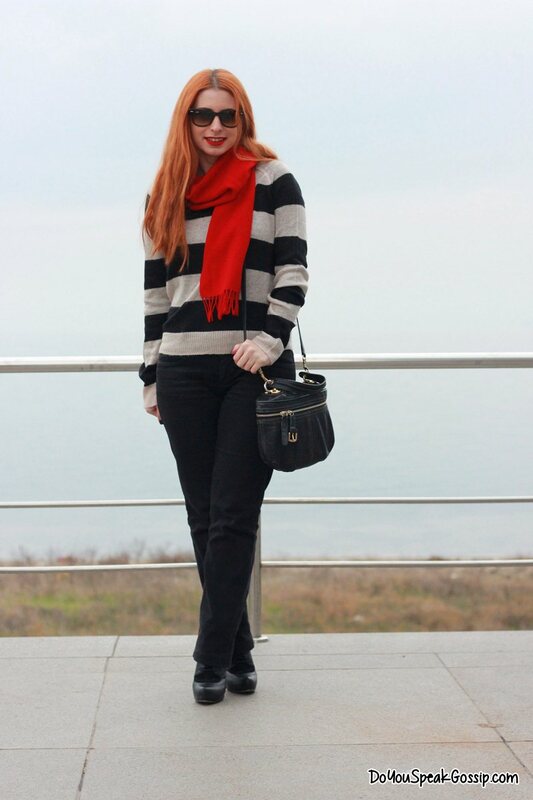 Your look is very cute and perfect fall attire! LOVE those boots! they looks so good with the tights and the dress! I really like your bun! maria recently posted..Want some pills? You my friend do not need a red carpet at all, you never fail to look so chic, love the boots! Vivian recently posted..Where are the fish? It is a laundromat. People come here to clean their clothes. Then they reuse them. Your outfit looks great on you! Very lovely! Gorgeous boots and the pics are so glamorous! I agree, who needs a red carpet when you have this fabulous wall to use instead? I love your dress, huge fan of navy this season! Your hair looks soo pretty!